Pretty much the moment I started at Berroco we’ve been talking about GIFTS. It started way back in September with tiny holiday sweaters and gift sets you could make on a budget. There was a bit of a debate over the propriety of verbing a noun (I maintain that it is okay in the case of ‘gifting’ and Dictionary.com agrees). This week we’ve decided to give our KnitBits subscribers a gift–a chance to win one of four baskets specially selected by members of the Berroco design team. No worries if you’re not already a subscriber, you can enter until 12 p.m. PST on December 15th (your entry will also sign you up for the KnitBits newsletter). Our baskets are totally idiosyncratic, though mine was a little conservative to begin with. It contained the yarn to knit Crotona in a watery blue shade of Cuzco since that is what I have been knitting for myself in between holiday gift knitting. After I saw the masterpiece Donna had whipped up, I knew I had to step up my game. I finally settled on a basket stuffed to the gills with two skeins of every color of Ultra Alpaca Fine. I threw in lots of Clover bamboo DPNs and Booklet #275 which is full of basic sock patterns. The idea was that you could knit socks for yourself or your friends all year long but I immediately came up with a billion other uses for the yarn. I think it would be perfect for crewel, the wool embroidery that is making a comeback. It would also totally rock on the rigid heddle loom–the high yardage (I just typed ‘yarnage’ by mistake, tee hee) and the nylon content are perfect for weaving with. 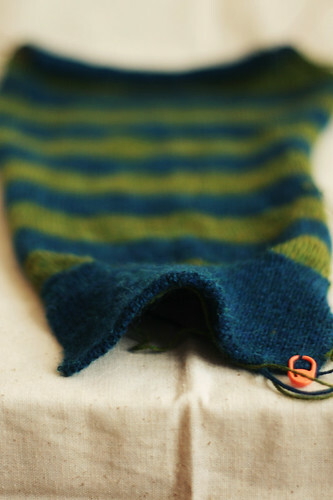 If you can believe it, Elin, a Swedish blogger living in Melbourne is knitting a STRIPED CARDIGAN with it. This makes her a high priestess of patience IMHO and check it out, she’s not cutting any corners. My new year’s knitting resolution is to take a page from Elin’s book (blog) and knit simply but well. And since this is a blog entry about gifts and the holidays I may as well share my stance on it–it’s the knitter’s way, no? I have done exactly one Christmas where everyone got a handknit gift and it was a very harried December. This year I took the Buy Handmade pledge and have had a fabulous time visiting Etsy and places like Craftland. Now that the crafting pressure is off I’m more motivated than ever to knit for friends and family! I’m loving Closely Knit by Hannah Fettig and Knit One, Embellish Too by Cosette Cornelius-Bates. Good luck to all us gift knitters! Remember to rest! I decided everyone in the family should receive the knitted felted clogs this year (12 pair) and have finished them, knit,felted AND dried. Now knitting a shawl for my Mother. Should have it finished by Christmas. Best of luck to all who enter the contest, those are lovely baskets. lol, chose your basket too, of course! so do you have power in your area? my mom was lucky enought to be just north of the major ice. We on the west coast bought the second to last generator friday night after losing power 7 times that day alone…no more! smile That person knitting stripes…serious patience angel! 3rd times the charm. Had trouble getting my gift basket to look presentable, then I went to http://www.juliabettencourt.com/helps/gift.html and I started with tissue paper in different colors..that turned out to be the key, it kept everything from sinking to the bottom. then i got the idea…why does it just have to be about yarn, my daughter also loves tea. so I bought a collection of her favorites, took them out of the box and arranged it around the basket as well. yarn, crochet hooks, tea, and a walmart card (only major chain I know of down there) and its ready to go. I will let you know what she thinks when she calls me up and tells me its there. Also, I contacted her husband and gave him a heads up that something special was coming and he said he would be ready with a camera to take a picture of her reaction for me. If I figure out how…I will post it here. http://www.ravelry.com/projects/peepla/kaylans-christmas-bouquet it came out great but i have not recieved her reaction photo yet…just a very loud THANK YOU THANK YOU THANK YOU call. hahahaha you guys have got to try this, its absolutely worth it.